Blogging about the creative, independent lifestyle, incredible scenery, actives and other events on the north Oregon coast, and the Manzanita, Oregon area. Traveling to Manzanita and the north Coast? We've got you covered! Vacationing on the Oregon coast? Looking for a Manzanita rental, lodging, things to do or places to see in the Manzanita an north Oregon coast area. 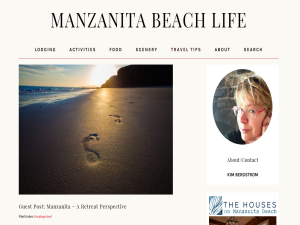 This what your Manzanita Beach Life Blog Ad will look like to visitors! Of course you will want to use keywords and ad targeting to get the most out of your ad campaign! So purchase an ad space today before there all gone!